There is really only one entity—the federal government—that can realistically reformat society in ways that will prevent large swaths of the country from becoming jobless zones of derelict buildings and broken people. Nonprofits will be at the front lines of fighting the decline, but most of their activities will be like bandages on top of an infected wound. State governments are generally hamstrung with balanced budget requirements and limited resources. It was less the buildings and surroundings and more the people. They seemed despondent and depressed, like their horizons had been lowered to simply scraping by. As for me, I had gone from being an underdog to one of the guys with the answers, from finding the most marginalized or excluded person in the room to finding the richest person and making him or her feel special. spent a lot of time with people who had already won, which was not what I’d envisioned. Think of your five best friends. The odds of them all being college graduates if you took a random sampling of Americans would be about one-third of 1 percent, or 0.0036. Google “Adsum” by Iamus and take a listen. Surgeons are among the highest-trained, most highly compensated doctors because cutting people open is a big deal. Yet their highest-value work is, for the most part, manual and mechanical. Some patients also might prefer seeing a human doctor, though I suspect this preference will fade over time. There’s a big distinction between humans as humans and humans as workers. The former are indispensable. The latter may not be. It’s worth considering whether humans are not actually best suited for many forms of work. Consider also the reverse: Are most forms of work ideal for humans? That is, if we’re not good for work, is work good for us? Voltaire wrote that “Work keeps at bay three great evils: boredom, vice, and need.” The total absence of work is demonstrably a bad thing for most people. Part of this understanding in America is a high level of commitment to work—educated Americans are working longer hours than they did 30 years ago, and many are expected to be available via email on nights and weekends, even as working hours have dropped in other developed countries. Benjamin Hunnicutt, a historian at the University of Iowa, argues that if a cashier’s job were a video game, we would call it completely mindless and the worst game ever designed. But if it’s called a job, politicians praise it as dignified and meaningful. Hunnicutt observes that “Purpose, meaning, identity, fulfillment, creativity, autonomy—all these things that positive psychology has shown us to be necessary for well-being are absent in the average job.” Most jobs today are a means for survival. Without their structure and support, people suffer psychologically and socially, as well as financially and even physically. Whether work is good for humans depends a bit on your point of view. We don’t like it and we’re almost certainly getting too much of it. But we don’t know what to do with ourselves without it. Oscar Wilde wrote, “Work is the refuge of people who have nothing better to do.” Unfortunately that may describe the vast majority of us. The challenge we must overcome is that humans need work more than work needs us. Betting against new jobs has been completely ill-founded at every point in the past. History repeats itself until it doesn’t. The United States instituted universal high school; in 1910 only 19 percent of American teenagers were in a high school, and barely 9 percent of 18-year-olds graduated. In college, I learned about the efficient capital market hypothesis: stock market prices reflect all available information, and attempts to beat the market are going to be ineffective over time. Now, most every investment professional believes that this is grossly incorrect or at least incomplete given the financial crash, the rise of behavioral economics, the success of certain hedge funds, and the fact that trading firms are investing millions in having a faster pipe to the exchanges to front-run other traders. The employment market is loaded with friction. We all know that in real life. Yet so much of our policy assumes a dream world where people are infinitely mobile across state lines, know what jobs are there, have the savings to wait it out, make wise decisions about school, are endlessly resilient, and encounter understanding employers who are rooting for them and can see their merits. Successfully retraining large numbers of displaced workers would require a heroic number of assumptions to prove true. The government needs to be able to identify displaced workers over a range of industries and have both the resources to pay for mass retraining and the flexibility to accommodate individual situations. Each person needs to have the capacity and will to be retrained in an in-demand field. The government needs to be an effective disseminator of information to thousands of individuals in real time. The worker needs to actually learn new marketable skills from the course or school in question. Last, there need to be new employers in the region that want to hire large numbers of newly trained middle-aged workers as opposed to, say, younger workers. We should 100 percent invest in successful retraining of employees. But we should also know that we’re historically very bad at it even in situations where we know displacement is happening. There are presently a record 95 million working-age Americans, a full 37 percent of adults, who are out of the workforce. Ryan Avent of the Economist poses a theory that technology has created an abundance of labor, both human and machine, and that companies when faced with both low labor costs and a low-growth environment invest less in new technology, which leads to lower productivity growth. This would suggest that we’re in an environment where employers are faced with low incentives to innovate because people are quite cheap to hire. The way management teams work is that we generally try to grow and take advantage of opportunities. We try to operate efficiently, but it’s not our number one priority all of the time. We also don’t walk around trying to be jerks in periods of relative prosperity. We joked at Venture for America that “smart” people in the United States will do one of six things in six places: finance, consulting, law, technology, medicine, or academia in New York, San Francisco, Boston, Chicago, Los Angeles, or Washington, DC. Conventional wisdom says the “smartest” things to do today are to head to Wall Street and become a financial wizard or go to Silicon Valley and become a tech genius. Instead of seeing college as a period of intellectual exploration, many young people now see it as a mass sort or cull that determines one’s future prospects and lot in life. It turns out that depressed, indebted, risk-averse young people generally don’t start companies. This will have effects for decades to come. This is a disaster in the making because technology is transforming society and our economy while politicians are left responding to the effects ineffectively years after the fact or, worse yet, ignoring them. Occasionally we see people leave for a more hospitable or child-friendly environment. We envy them a little, while also patting ourselves on the back for sticking it out. Professional empathy is limited. On some level, most of us recognize that we are servants to the tide of innovation and efficiency. As the water rises, we will protest as we clamber to higher ground. The underlying logic of the meritocratic system is this: If you’re successful, it’s because you’re smart and hardworking, and thus virtuous. If you’re poor or unsuccessful, it’s because you’re lazy and/ or stupid and of subpar character. The people at the top belong there and the people at the bottom have only themselves to blame. Being good at these tests, however, has very little to do with character, virtue, or work ethic. They just mean you are good at the tests. We say success in America is about hard work and character. It’s not really. Most of success today is about how good you are at certain tests and what kind of family background you have, with some exceptions sprinkled in to try to make it all seem fair. Intellect as narrowly defined by academics and test scores is now the proxy for human worth. Efficiency is close behind. Our system rewards specific talents more than anything. The meritocracy was never intended to be a real thing—it started out as a parody in a British satire in 1958 by Michael Young. At the time, a world where “intelligence fully determined who thrived and languished was understood to be predatory, pathological and far-fetched,” observes journalist David Freedman. gives everything a tinge of justice. It makes the suffering of the marginalized more palatable, in that there’s a sense that they deserve it. Perhaps the most remarkable thing is that they often agree—they think they deserve it, too. They’re wrong. Intelligence and character aren’t the same things at all. People in the bubble think that the world is more orderly than it is. They overplan. They mistake smarts for judgment. They mistake smarts for character. They overvalue credentials. Head not heart. They need status and reassurance. They see risk as a bad thing. They optimize for the wrong things. They think in two years, not 20. They need other bubble people around. They get pissed off when others succeed. They think their smarts should determine their place in the world. They think ideas supersede action. They get agitated if they’re not making clear progress. They’re unhappy. They fear being wrong and looking silly. They don’t like to sell. They talk themselves out of having guts. They worship the market. They worry too much. Bubble people have their pluses and minuses like anyone else. also thought—correctly—that even if it didn’t work out I’d be fine. My story is one of relative abundance, and it should feel familiar. There’s a substantial correlation between one’s socioeconomic background and starting a successful company. The truth is that it’s a lot easier to start a company if you have a few things going for you. In addition to resources, you have a mindset of abundance. After you make one thing work out, you kind of think you can make anything work out. But the mechanics of entrepreneurship make it a lot more accessible to people who can realistically gather meaningful resources, defer money, and take on risk. That’s an environment of abundance. Money comes to you and good things happen to you seemingly for no reason, though the real reason is where you happen to be sitting. A mindset of scarcity is more than just “stress”—it actually makes one less rational and more impulsive by consuming bandwidth. We all respond poorly to scarcity. One could argue that it is essential for any democracy to do all it can to keep its population free of a mindset of scarcity in order to make better decisions. A culture of scarcity is a culture of negativity. People think about what can go wrong. They attack each other. Tribalism and divisiveness go way up. Reason starts to lose ground. Decision-making gets systematically worse. Acts of sustained optimism—getting married, starting a business, moving for a new job—all go down. When jobs leave a city or region, things go downhill pretty fast. The central point is this: In places where jobs disappear, society falls apart. The public sector and civic institutions are poorly equipped to do much about it. When a community truly disintegrates, knitting it back together becomes a herculean, perhaps impossible task. Virtue, trust, and cohesion—the stuff of civilization—are difficult to restore. If anything, it’s striking how public corruption seems to often arrive hand-in-hand with economic hardship. In a growing organization, people are more optimistic, imaginative, courageous, and generous. In a contracting environment, people can become negative, political, self-serving, and corrupt. One of the great myths in American life is that everything self-corrects. If it goes down, it will come back up. If it gets too high, it will come back down to earth. Historically, virtually all American cities had more businesses open than close in a given year, even during recessions. After 2008, that basic measurement of dynamism collapsed. realized that, if you’re managing in a contracting environment, it’s possible that leaving the urinal duct-taped might be a perfectly reasonable way to go. Optimism could be stupid. When you’re used to losing people and resources, you make different choices. Getting married is an act of optimism, stability, and prosperity. It also can be expensive. Women are now the clear majority of college graduates—in 2017 women comprise 57 percent of college graduates, and the trend is expected to continue in the coming years. Single mothers outnumber fathers more than four to one. I realized that there are many similarities between being a parent and being an entrepreneur. Here is a partial list: • Everyone’s got an opinion. But no one knows what they’re doing. • The first two years are brutal. • No one cares as much as you do. • On its best days it fills you with meaning and purpose. • People lie about it all the time. • Choose your partner wisely. • Heart is more important than money. But money helps. • It is very, very hard to outsource. • You find out who your friends are. And you make some new ones. • Occasionally the responsibility blows your mind. • If you knew what it entailed you might not get started. But you’re glad you did. • There will be a thousand small tasks you never imagined. • How you spend your time is more important than what you say. • Everything costs more than you thought it would. • Most of the work is dirty, thankless, and gritty. • You learn a lot about yourself. You get tested in ways that you can’t imagine. • When you find someone who can really help you’re incredibly grateful. • You have to try to make time for yourself or it won’t happen. • Whatever your weaknesses are, they will come out. • You think it’s fragile. But it will surprise you. • You sometimes do things you weren’t sure you were capable of. • When it does something great, there’s nothing like it. • You start out all-important. Yet the goal is to make yourself irrelevant. • People sometimes give you too much credit. • There is a lot of noise out there, but at the end of the day it’s your call. • It gives your life a different dimension. You grow new parts of yourself. • It’s harder than anyone expects. It’s the best thing ever. A study showed that one out of every 550 patients started on opioid therapy died of opioid-related causes a median of 2.6 years after their first opioid prescription. The percentage of working-age Americans who received disability benefits was 5.2 percent in 2017, up from only 2.5 percent in 1980. Disability payments received by beneficiaries in these five states exceed $ 1 billion per month. 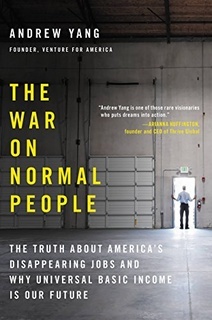 J. D. Vance writes of how the people in Ohio became angry that they were working hard and scraping by while others were doing nothing and living off of government checks. The numbers have grown to a point where more Americans are currently on disability than work in construction. We pretend that our economy is doing all right while millions of people give up and “get on the draw” or “get on the check.” It’s a $ 143 billion per year shock absorber for the unemployed or unemployable, whose ranks are growing all of the time. And it’s likely easier to think of yourself as genuinely disabled than as someone cheating society for a monthly draw. They speak to a primal set of basic impulses—to world creating, skill building, achievement, violence, leadership, teamwork, speed, efficiency, status, decision making, and accomplishment. They fall into a whole suite of things that appeal to young men in particular—to me the list would go something like gaming, the stock market, fantasy sports, gambling, basketball, science fiction/ geek movies, and cryptocurrencies, most of which involve a blend of numbers and optimization. It’s a need for mastery, progress, competition, and risk. How exactly are these game-playing men getting by? They live with their parents. You experience a continuous feeling of progress and accomplishment. We have entered an age of transparency where we can see our institutions and leaders for all of their flaws. Trust is for the gullible. Everything now will be a fight. Appealing to common interests will be all the more difficult. We are the most heavily armed society in the history of mankind—disintegration is unlikely to be gentle. In his book Ages of Discord, the scholar Peter Turchin proposes a structural-demographic theory of political instability based on societies throughout history. He suggests that there are three main preconditions to revolution: (1) elite oversupply and disunity, (2) popular misery based on falling living standards, and (3) a state in fiscal crisis. He uses a host of variables to measure these conditions, including real wages, marital trends, proportion of children in two-parent households, minimum wage, wealth distribution, college tuition, average height, oversupply of lawyers, political polarization, income tax on the wealthy, visits to national monuments, trust in government, and other factors. Even now, people of color report higher levels of optimism than poor whites, despite worse economic circumstances. It’s difficult to go from feeling like the pillar of one’s society to feeling like an afterthought or failure. Contributing to the discord will be a climate that equates opposing ideas or speech to violence and hate. Righteousness can fuel abhorrent behavior, and many react with a shocking level of vitriol and contempt for conflicting viewpoints and the people who hold them. Hatred is easy, as is condemnation. Addressing the conditions that breed hatred is very hard. However, it would be nearly impossible to curb automation for any prolonged period of time effectively across all industries. Doing nothing leads to almost certain ruin. Trying to forestall progress is likely a doomed strategy over time. When you’re left with no other options, the unthinkable becomes necessary. Peter Frase, author of Four Futures, points out that work encompasses three things: the means by which the economy produces goods and services, the means by which people earn income, and an activity that lends meaning or purpose to many people’s lives. Twelve thousand dollars a year is not enough to do more than scrape by. Very few people will quit their jobs because of a guaranteed income at this level unless they were in a marginal or exploitative situation. The available data bears this out. On the other hand, the benefits would be absolutely enormous: • It would be a massive stimulus to lower-cost areas. • It would empower people to avoid making terrible decisions based on financial scarcity and month-to-month needs. • It would be a phenomenal boon to creativity and entrepreneurship. • It would enable people to more effectively transition from shrinking industries and environments to new ones. • It would reduce stress, improve health, decrease crime, and strengthen relationships. • It would support parents and caretakers for the work that they do, particularly mothers. • It would give all citizens an honest stake in society and a sense of the future. • It would restore a sense of optimism and faith in communities around the country. • It would stimulate and maintain the consumer economy through the automation wave. • It would maintain order and preserve our way of life through the greatest economic and social transition in history. • It would make our society more equitable, fair, and just. Putting money into people’s hands and keeping it there would be a perpetual boost and support to job growth and the economy. Businesses will benefit immensely from the fact that their customers will have more money to spend each month—most Americans will spend the vast majority of their money locally. You may not recall that the U.S. government printed over $ 4 trillion in new money for its quantitative easing program following the 2008 financial collapse. This money went to the balance sheets of the banks and depressed interest rates. It punished savers and retirees. There was little to no inflation. With the Freedom Dividend, money would be put in the hands of our citizens in a time of unprecedented economic dislocation. It would grow the consumer economy. It’s a stimulus of people. The vast majority of the money would go directly into the economy each month, into paying bills, feeding children, visiting loved ones, youth sports, eating at the local restaurant, piano lessons, extra tutoring help, car repairs, small businesses, housing improvements, prenatal vitamins, elder care, and so on. Most Americans are so cash-strapped that most of the money would be spent locally and quickly. We’re trying relative deprivation and it’s not working. Half-measures are wasting time. Scarcity will not save us. Abundance will. Money has to come from somewhere. We’re used to the government spending billions wastefully to no great effect. By definition, none of the money would be wasted because it goes to citizens. It’s analogous to a company giving dividends or moneys to its shareholders. No one regards that as a waste of money, because the shareholders theoretically are the owners of the company. Are we not, as the citizens of the United States, the owners of this country? You know what’s really expensive? Dysfunction. Revolution. Keeping people and families functional will largely pay for itself. “It will destroy people’s incentives to work.” All of the available data shows that work hours stay stable or at most decrease modestly with a basic income. First, work is vital and the core of the human experience. Second, no one will want to work if they don’t have to. These two ideas are at complete odds with each other. Either work is a core of the human experience and we’ll do it even if we don’t necessarily have to, or work is something we have no interest in doing and we do it only to survive. “People will spend the money on stupid things, like drugs and alcohol.” The data doesn’t show this. In every basic income study, there has been no increase in drug and alcohol use. If anything, an improved sense of the future motivates people to figure out a plan for how to improve their lot. There are true addicts, and some people are self-destructive. But it’s not like a lack of money is presently keeping people from using opioids and alcohol—they find a way to get both money and drugs right now, sometimes illicitly. Here’s the thing—poor people tend to be much more careful with their money than rich people. Many of the populations people are most eager to see employed and kept from idleness are among the least competent and able to be employed by the private sector. The natural tendency is to spend a lot of money on people doing things that aren’t actually that valuable. Perhaps most crucially, endless new businesses would form. If you are in a town of 5,000 people in Missouri and everyone is struggling to get by, starting, say, a bakery may not be that attractive. But with a UBI, there will be an additional $ 60 million being spent in that town next year. You personally will have an income to fall back on if the bakery doesn’t work out. Time banking is a system through which people trade time and build credits within communities by performing various helpful tasks—transporting an item, walking a dog, cleaning up a yard, cooking a meal, providing a ride to the doctor, and so on. Some might ask, “Why create a new digital currency instead of just using dollars?” First, people will respond to points in a different way than they would if they were paid very low monetary amounts. Second, everyone will feel much more open and comfortable sharing balances if it’s a new social currency. You want people to advertise and reinforce their behavior. Behavior is much more likely to be reinforced if it’s social and recognized. Third, by creating a new currency, the government could essentially induce billions of dollars of positive social activity without having to spend nearly that amount. Our current form of institutional capitalism and corporatism is just the latest of many different versions. Now imagine a new type of capitalist economy that is geared toward maximizing human well-being and fulfillment. Human Capitalism would have a few core tenets: 1. Humanity is more important than money. 2. The unit of an economy is each person, not each dollar. 3. Markets exist to serve our common goals and values. I’m no fan of big government. The larger an organization is, the more cumbersome and ridiculous it often gets. We have so many brilliant doctors—they should be innovators, detectives, guides, and sources of comfort, not glorified assembly line workers. And freeing health care from being locked to a job would be a massive boon to economic growth and dynamism. Similar to health care, the automation wave should lead us to invest more people in education and human capital development. It should also drive us to dramatically increase our emphasis on technical and vocational training and apprenticeships at the high school level to take advantage of the jobs that will continue to exist. Grit, persistence, adaptability, financial literacy, interview skills, human relationships, conversation, communication, managing technology, navigating conflicts, preparing healthy food, physical fitness, resilience, self-regulation, time management, basic psychology and mental health practices, arts, and music—all of these would help students and also make school seem much more relevant. The purpose of education should be to enable a citizen to live a good, positive, socially productive life independent of work. People teach other people. If you want to teach thousands of students well, you teach one student well. Then you do it thousands of times. Climb to the hilltop and tell others behind us what we see. What do you see? And build the society we want on the other side.